St Enda's skipper James McAuley believes that a fusion of the team's "unique bond" and the managerial skills of Frank Fitzsimons can help the club to make a bold bid for All-Ireland success. The Glengormley outfit currently find themselves in unimagined territory having been crowned Antrim and Ulster intermediate club champions after decades spent striving for even a broad hint of recognition. While the celebrations continue in full swing following the provincial final victory over Mullahoran, McAuley is anxious to ensure that the players remain focused for their All-Ireland club semi-final against Galway and Connacht champions Spiddal. "The run we have been on recently has just been unbelievable," states Fitzsimons. "We are fortunate in that we have a very tight group of players. Most of us went to school together, we have played together from Under-8 level, we were in and out of each other's houses so the bond has always been there. "There is no greater success than in winning trophies with players you have been with all your life." While the team has sprinted into the national spotlight and is already being mentioned as candidates for further glory, McAuley is quick to direct credit to manager Fitzsimons for what has been achieved to date. "Frank is just unbelievable, that's the only word I can use to describe him," says McAuley, who is studying for a Masters degree in Queen's University. "He has come in this year and worked wonders for us. He has taken us to where we are now but you can be sure he won't be satisfied with this. He will want us to drive on." Earlier this year, Moy were crowned All-Ireland intermediate champions, and now St Enda's are aiming to emulate the Tyrone side's success. "Before we went into the Antrim championship we took stock of what Moy did this time last year and then their All-Ireland performances at the start of this year, and we feel now that there is no reason why we can't take a leaf from their book," insists 22-year-old McAuley. "Moy did Tyrone and Ulster proud in winning the All-Ireland intermediate club title and we have set our hearts on following in their footsteps." McAuley is one of several players who could now come under the microscope of Antrim manager Lenny Harbinson. 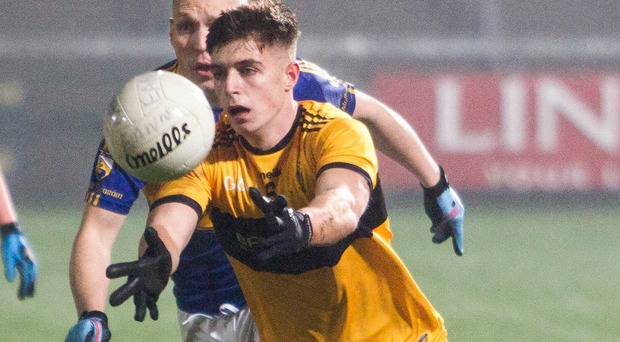 Peter Healy is already an established player with the Saffrons, as well as being a shining light in the UCD side, while Eoin Nagle, Odhran Eastwood, Ruairi Scott, Kristian Healy and Conan Lyttle look to have the credentials to thrive in the inter-county sphere. "Obviously I have been following St Enda's progress closely and certain players have come under our radar. But obviously they will be needed by the club for the All-Ireland series early in the New Year," says Harbinson.